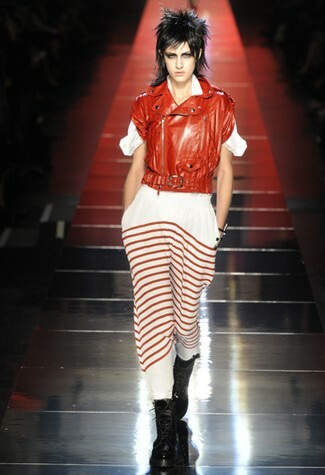 Jean Paul Gaultier’s Spring Collection recreated the ’80s style. Jackets with exaggerated shoulders made a comeback, in colours like sea green,indigo blue, white and red. Teamed up with flirty blouses for some rock n’ roll charm and stylishly lose the jacket for a night out straight from work. 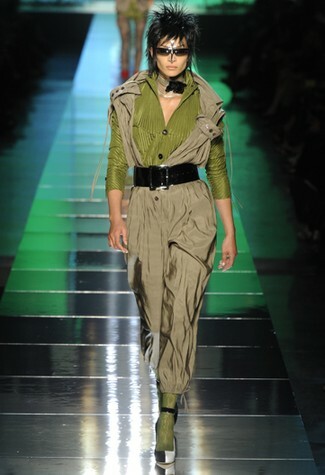 Jean Paul Gaultier’s Spring Collection delivered an extravagaza show with a message: Bigger Models have curves too! Gossip lead singer, Beth Ditto was the show opener in Gaultier’s silver laser cut strips dress. Punky Eighties, yes! 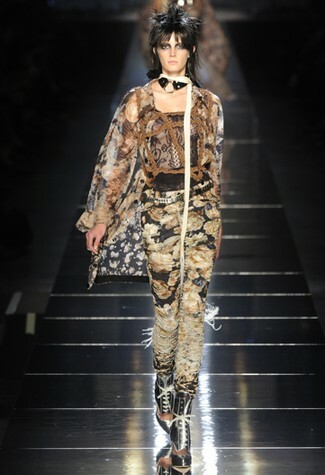 fishnet stockings, biker’s leather jackets, padded shoulder jeans shirts, tailored blazers with coned shoulders and matching pants; pleated silks and palm prints. 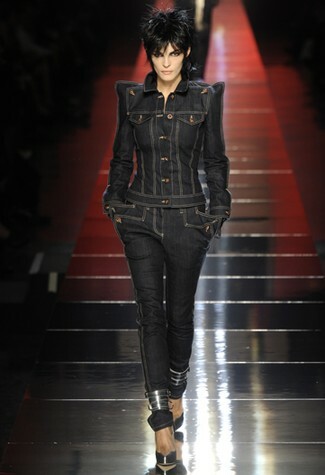 For the new seductive rock glam, Gaultier picked up lacy stockings slipped on scrappy stilettos, paired with skinny jeans with wide buckled belt creating sumptuous silhouettes. Tailored dressy to rock chic – a wide variety of styles and fabrics were beautifully put together; mixed with elements distinctly different, but well connected. This is what collection editing is about. Colour splashes vigorously, elaborate mixed with quirkiness. 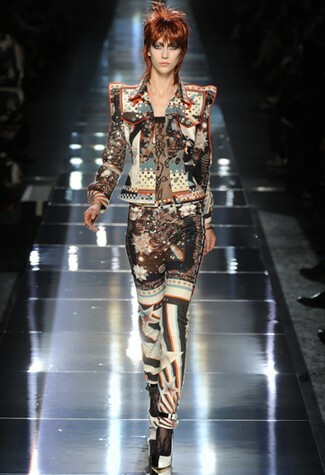 But the palm prints were continuation from the last two seasons, and somewhat tiring. Almost like an extension of the last range and not a separate one. The use of fine and gilt bust, chunky bracelets with quirky charms, helped complete the look…with the big hairstyles, punked and stiffen.